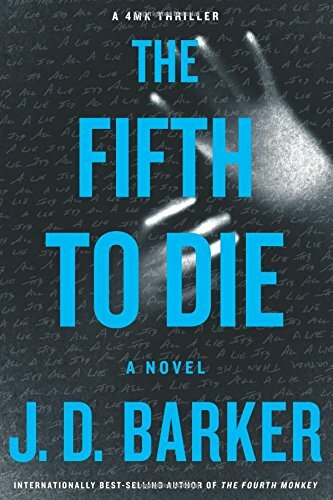 Considering the cover of the book says this is a “4MK Thriller,” I’m not giving too much away by saying that The Fifth to Die, J.D. Barker’s sequel to The Fourth Monkey, features the return of Detective Sam Porter and his white whale, Anson Bishop, also known as the Fourth Monkey Killer or 4MK. Detective Porter and his team have been pulled off the hunt for 4MK when a body is found in a frozen lake. The body is that of a young girl who has been missing for a couple of weeks…but she is found under the ice, dressed in the clothes of a girl who disappeared just that morning. Chicago immediately fears that 4MK is back to his old tricks, but Porter believes this to be the work of someone else. Serial killers tend to have a unique style, and this murder does not fit the pattern of 4MK. As the body count climbs and the mystery deepens, the question persists: does this have anything to do with 4MK? The hunt for the killer (or killers) expands beyond Chicago, reaching first to New Orleans and then to North Carolina. Bishop is back, but what if anything does he have to do with these new deaths? Why has he sent a picture of a mystery woman to Detective Porter, a woman being held in jail in New Orleans? What clues remain in his diary? And can they catch him in time to prevent whatever plans he has made from coming to fruition? Barker has taken the loose threads remaining from The Fourth Monkey and woven them together to create a new and even more involved story. Tension mounts throughout the book. As the view shifts from detective to victim to killer, we learn more about the mysterious Anson Bishop. But each new revelation brings more questions. By the end of the book we see some mysteries solved. Many more, though, remain tantalizingly unresolved. Bishop remains free to wreak more mayhem. Porter has lost him again. His team is in desperate straits. And the reader, at least this reader, is left with nightmares about an elusive killer and a very satisfying thriller. In just two books, J.D. Barker has become one of my favorite thriller writers. The Fifth to Die could be read by itself. Enough backstory is given that it stands on its own. But it will be more satisfying to read the two books in order. Just, don’t start them if you need to get some sleep. You will have trouble putting either of them down. Again, a warning to more sensitive readers. There are violent scenes depicted in The Fifth to Die. If that sort of thing bothers you, this is not the book for you. And it is not a book I would recommend to children or tweens. The victims in the book include teenagers, which may make the violence even more disturbing to some. For the genre it is not particularly violent, but the thriller genre can be violent and Barker does not shy away from the grittier aspects of his subject.